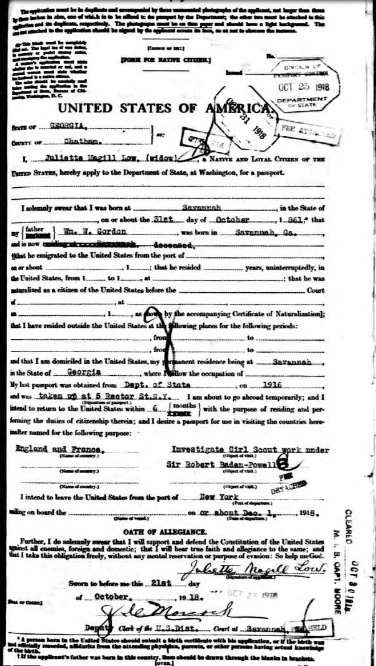 Less than a minute later, I texted her a copy of Low’s 1919 passport application, which states her height at 5 feet, 4.5 inches. 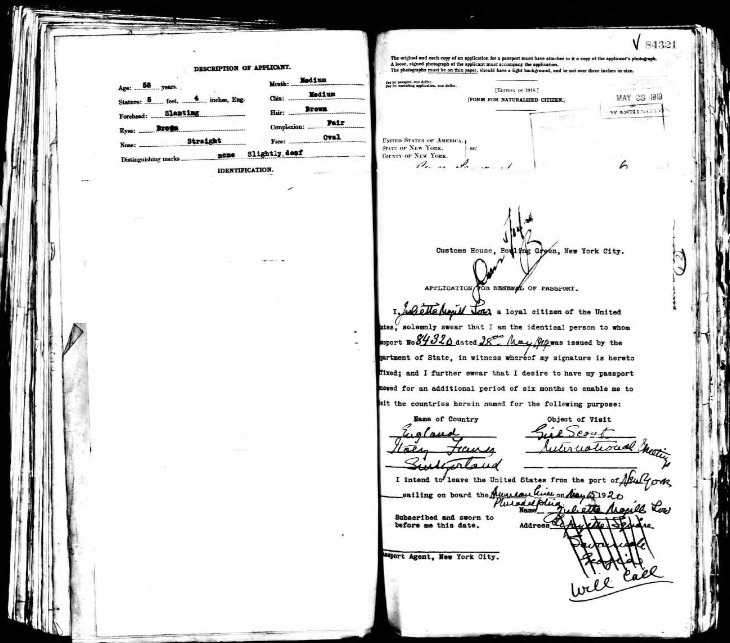 I had found the passport records earlier on Ancestry.com. It is fun to see Daisy’s handwritten comments, description of her own appearance, and to read the reasons given for her travel abroad. The passport photos are great, as well. 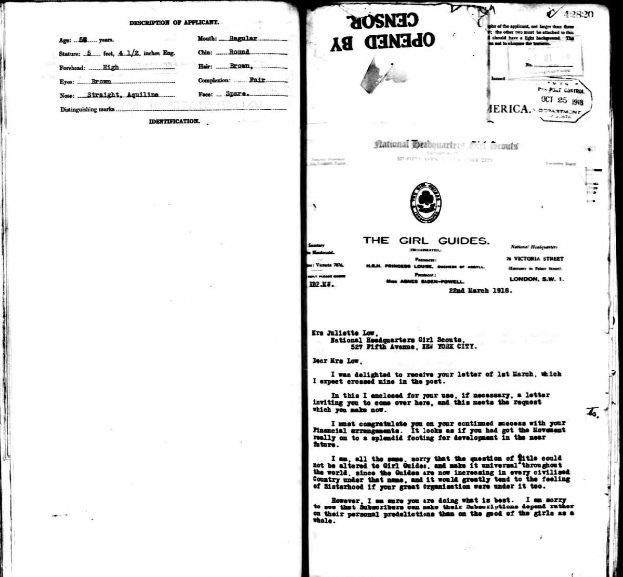 The documents have been bound into hardback volumes, and some text is not fully visible. 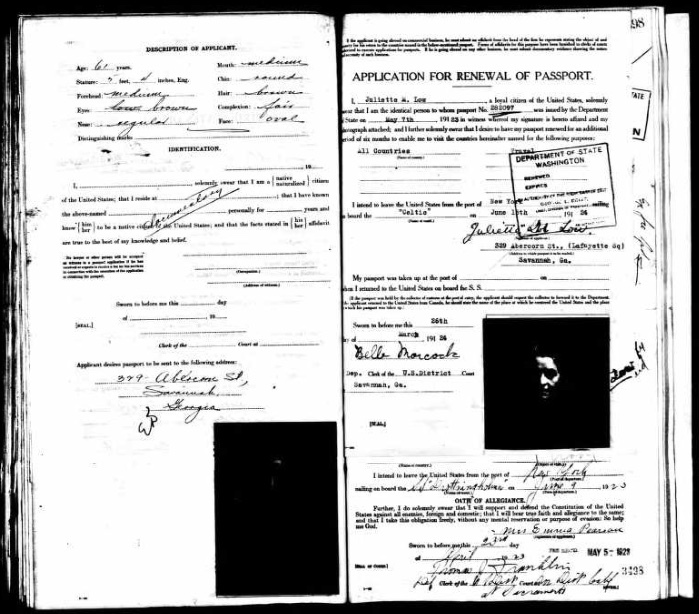 Her 1915 application gave her destinations as England, Italy, and Egypt, and she requested that the document be delivered to her parents’ home on Oglethorpe Street. Daisy describes herself as 5 ft, 4.5 inches tall. 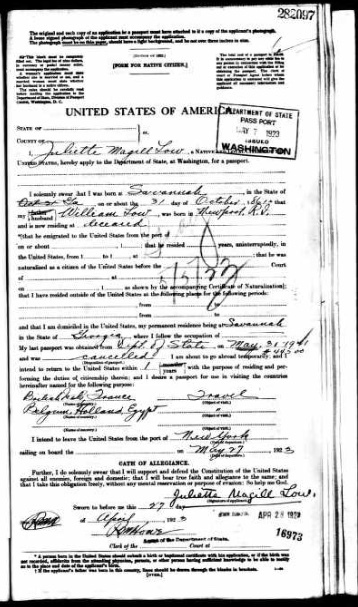 She renewed her passport in 1916, and her brother’s statement served in place of a birth certificate. 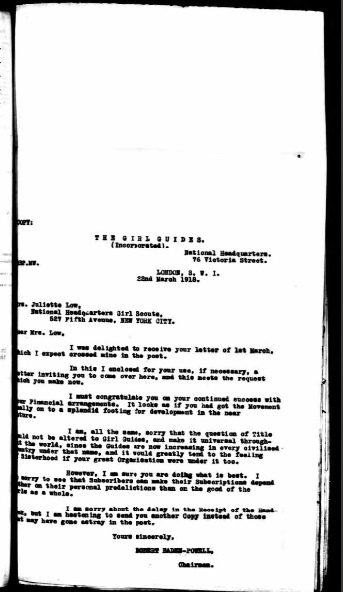 The file also includes a letter noting that her landlord in London, Lady Coghlan, was upset to discover that Daisy had used parafin oil lamps and left at least one sink stopped up. 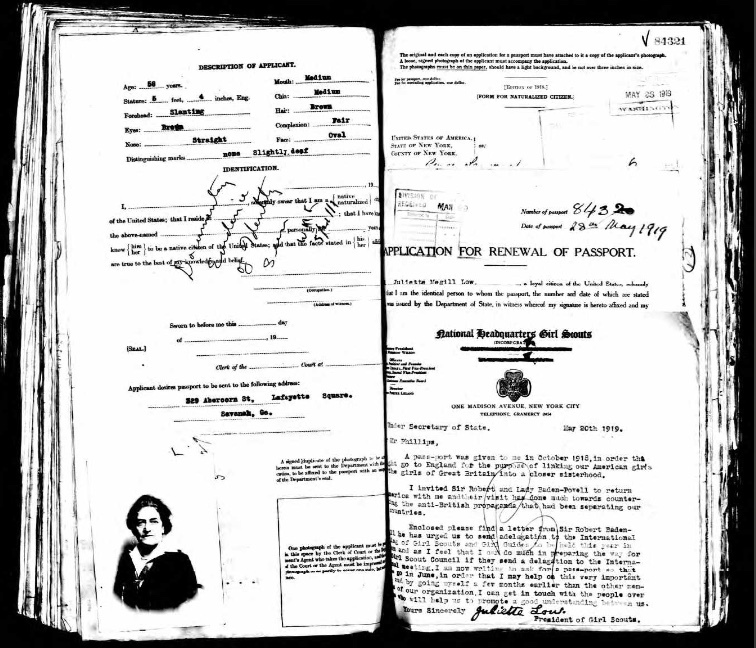 By 1918 Daisy had misplaced her passport and urgently needed a new one. 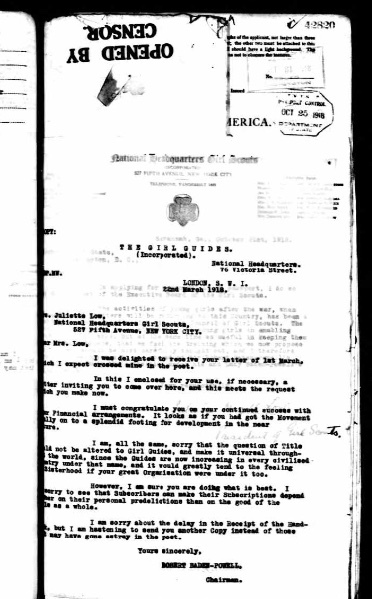 She included a letter from Boy Scout founder Lord Baden-Powell explaining the reason for her travel. 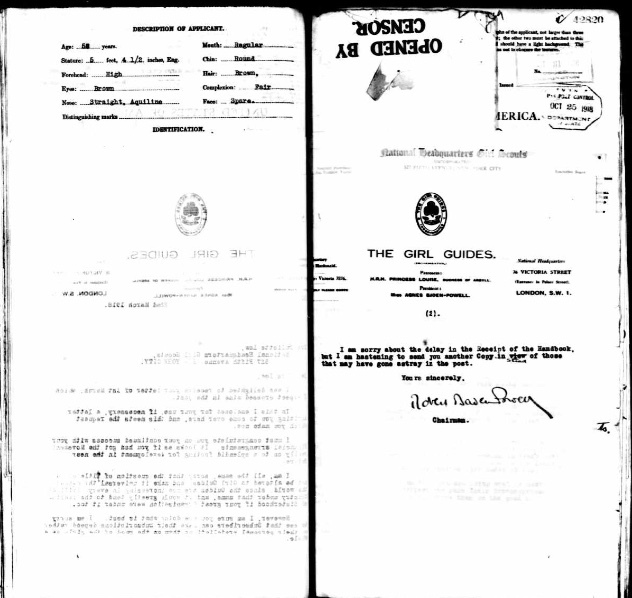 In 1919 she explained that she needed to renew her passport for six months to attend an international scouting conference. She handwrote that her travels would include Switzerland, and another letter from Lord Baden-Powell confirmed the international meeting. 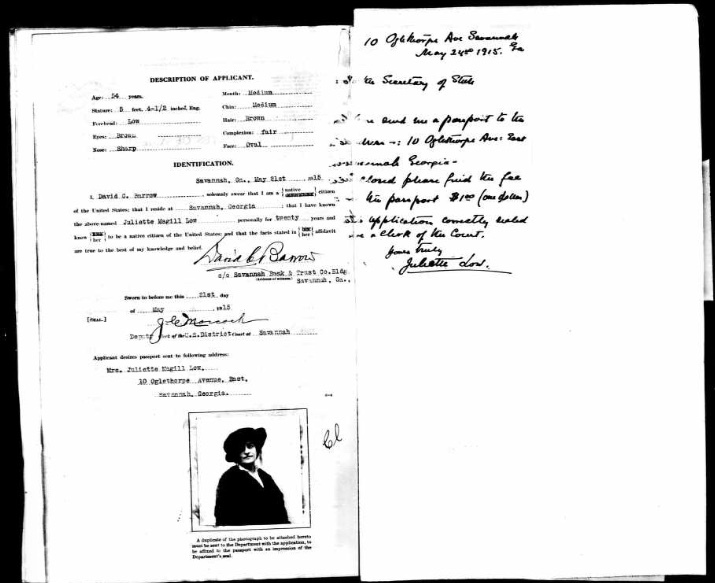 The last passport on file was for 1923. This trip included Egypt. She also indicates that her previous passport had been canceled. 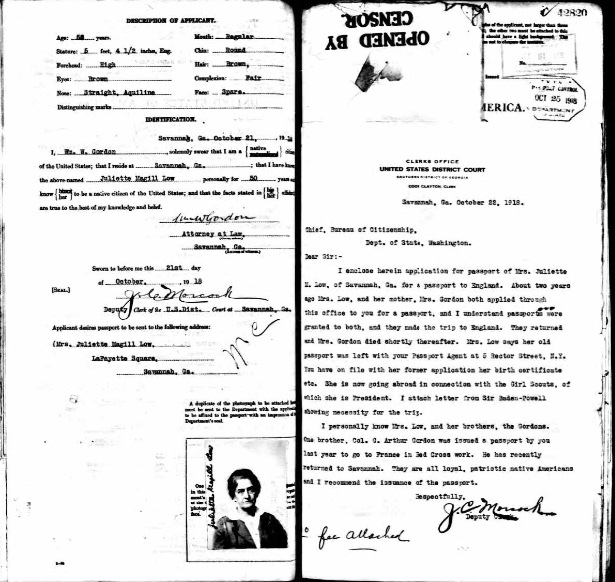 Unfortunately, the photo for the 1923 document is almost illegible. Likely the product of poor quality microfiche. 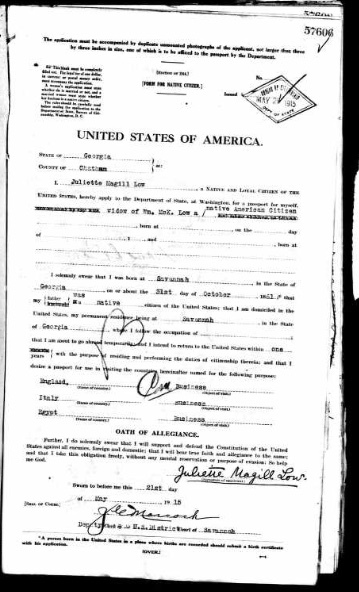 I always enjoy looking at original documents, especially ones with personal details such as eye color, face shape, and height. Now I have yet another reason to look up to Daisy Low. One hundred and six years ago today, a 51-year old widow reinvented herself by inventing the Girl Scouts of the USA. 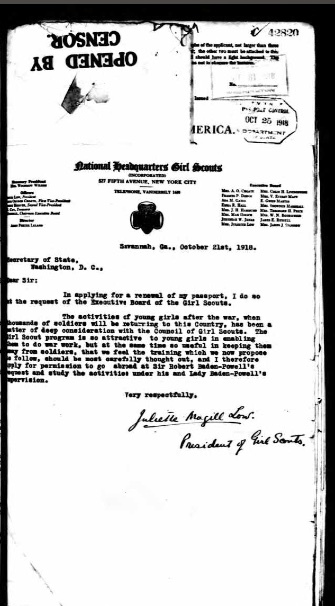 Juliette Gordon Low invited 18 girls to the first Girl Scout meeting on March 12, 1912, in the carriage house of her home in Savannah, Georgia. Today that building, known as the First Headquarters, welcomes girls (everyone, actually) from around the world who want to learn more about this woman and her life-changing movement. I look forward to being there next week. Here’s to the women willing to break the mold, challenge tradition, and shape the future. And here’s to life’s second acts! !